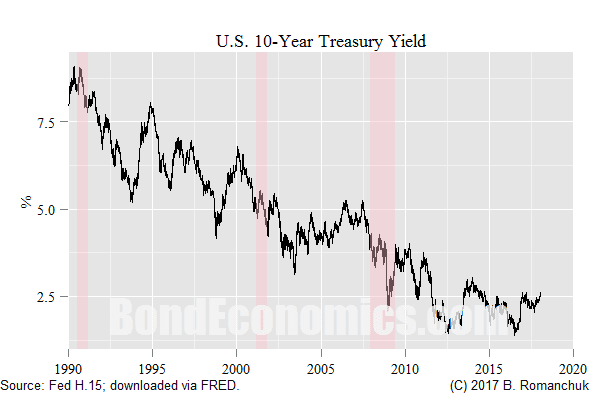 The benchmark U.S. 10-year Treasury has entered a predictable mild bond bear market, and the financial press have rolled out their "What happens when the Treasury Market Dies?" think pieces. (As an immediate disclaimer, I do not do forecasts, and thus I did not "predict" this bear market. At most, I probably noted that previous pricing was consistent with a decent probability of recession happening over the next few years.) As is usual, we are seeing a lot of technical analysis. The technical analysis battle is between two forces: the drawing straight lines is destiny belief, versus the belief in the power of round numbers. The "straight lines are destiny belief" is fairly well known; it is easy to draw a descending straight line on a long-term bond yield chart (like the one above). The latest move probably broke above a lot of the lines that you could draw. The next logical step is the following: if bond yields are no longer going down, they have to go up. This is going to collide into the "big round numbers" theory. The theory is that a lot of asset allocators/bond managers have said: "I will cover my short/underweight when the yield hits a round number (3% in this case)." I no longer pay attention to market chatter, but anecdotes about liability managers having hedging programmes kick in at those round number levels was a constant across all developed markets. As a recovering secular bond bull, I have a natural affinity to the "round numbers" theory. Anyone selling stories about a bond market apocalypse has to explain why institutional investors that are massively short duration versus their liabilities are going to let yields shoot higher. (By contrast, most institutional investors did not even know how to calculate the duration of their liabilities before the early 1990s.) That said, a 3% nominal yield is pathetically low in an environment where nominal GDP averaged 4% a year even during the worst of "secular stagnation." So if I were to rely on the "round number" theory, I would put a lot more faith in 4%, as that is an even rounder number. Once again, the fundamentals will win, with the fundamentals being forward Fed pricing. The phrase "bond bubble" is back. That usage is an insult to any self-respecting bubble. In financial theory, people have tried to use a technical description -- a hyper-exponential price trajectory, based on the expectation that the asset can be sold to someone else also discounting a hyper-exponential price trajectory. Other commentators use a qualitative measure: is there mass participation by retail investors, and does the asset gain lots of popular coverage? Bonds were arguably mis-priced -- on the basis that you can now buy them cheaper. However, any losses on long-term bonds are still paper losses. If there is a recession within the next few years, 10-year bonds purchased earlier might still outperform cash if held to maturity. 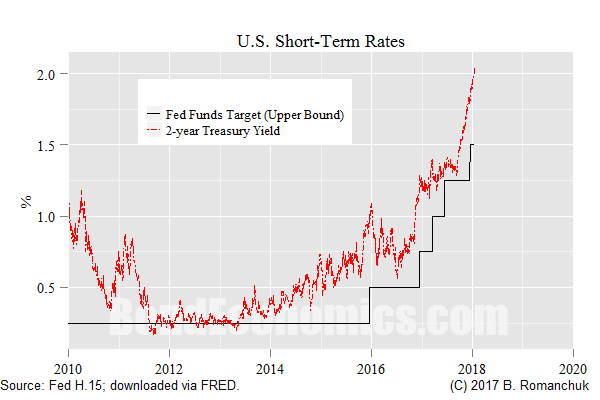 The chart above shows the origin of the mis-pricing: the front end of the curve disrespected the Fed's intentions to hike rates over a relatively short time span. The fact that the Fed was taking baby steps in tightening probably helped the complacency. (In some years, it was one hike per year, whereas the historical pace was one hike per meeting, with eight meetings a year.) The 2-year is finally starting to work in a bit of a cushion. That said, even if the front end continues to get hammered, bond bulls could come up for reasons for the curve to flatten (meaning that bond yields will rise less than one-to-one than the policy rate). It is not enough to expect forward rates to match the median Fed forecast (plus a term premium), an expectation has to incorporate the skew around the median forecast. Based on the post-1992 historical experience, the probability distribution is skewed towards a much lower policy rate in a recession, whereas accelerating inflation that justifies rapid rate hikes (as seen in the 1970s) has not happened. Even oil price spikes were not enough to trigger a second round of inflationary pressures. In other words, it appears entirely rational for the bond market to rise slowly in response to Fed rate hikes, as the hard-to-judge probability of recession counters the rise in the baseline forecast for the path of the policy rate. When the Fed was hiking at a pace at 200 points a year, the tightening was front-loaded, and the skew due to recession probability is relatively less important. In that environment, it is not surprising that bear markets were also front-loaded, with most losses incurred almost immediately (or even before the first hike). Finally, a rise in Treasury yields is not bearish for risk assets. The Fed is only going to raise rates in response to continued nominal growth, which implies that happy days for corporate profitability will continue. Inflation cutting into profit margins drastically would mean that labour is suddenly getting a bigger slice of the income pie, which seems somewhat optimistic. Faster nominal growth swamps the effect of a higher discount rate.